The Professional Achievement Award recognizes outstanding achievement in any professional field. This award honors alumni whose achievements in their fields have brought distinction to themselves as well as credit to the university. Rath has been head of the Materials Science and Component Technology Directorate, Naval Research Laboratory (NRL) since 1986 and in this role supervises the work of nearly 800 scientists, covering the entire spectrum of materials science and engineering. 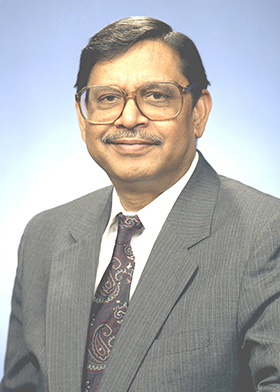 He has held several positions spanning more than five decades, including serving as head of the Materials Science Division, NRL. He also was a senior research scientist at Bain Laboratory, in Pittsburgh, and McDonnell Douglas Research Lab, in St. Louis. In addition, Rath has served as an educator at Washington State University, Carnegie Mellon University, and the University of Maryland. He is a member of the National Academy of Engineering and has served as president of the American Society for Materials. Rath has been honored with a number of prestigious awards for his work, three of which are particularly meaningful—two Presidential Rank Awards from presidents Bill Clinton and George W. Bush and the Padma Bhushan, one of the highest civilian awards, awarded by the president of India.